Energy levels tend to decrease as people get older. While this is often caused by the natural progression of aging and a lower metabolic rate, other factors may also play important roles. Fortunately, there are some things you can do to boost your senior loved one’s energy levels. 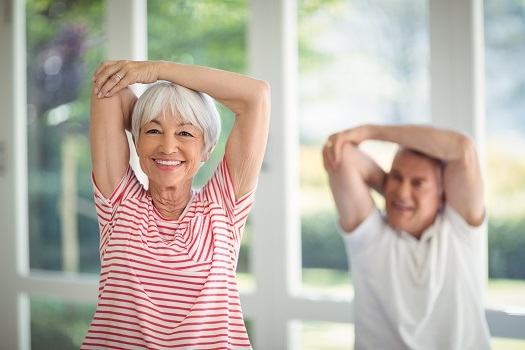 Mild exercise can boost energy levels in aging individuals, and it also promotes circulation and optimal blood flow to all areas of the body, including the brain. Exercising can enhance energy levels by optimizing effective breathing patterns, promoting cardiovascular health, lowering blood sugar levels, and stabilizing blood pressure. While exercising offers many health benefits, always check with your loved one’s physician before starting a new exercise program. For aging adults with health conditions that limit their ability to safely exercise on their own, a professional caregiver can be a great resource. If your aging loved one needs help managing everyday tasks or encouragement to adopt healthier lifestyle choices, turn to Home Care Assistance, a leading provider of home care. Winnipeg Home Care Assistance provides professional in-home caregivers around the clock to help seniors live longer, happier, and healthier lives. Medications can lead to side effects such as confusion, dizziness, weakness, and fatigue. If your loved one takes medications to control blood pressure, regulate the heart rate, reduce pain, or stabilize blood sugar levels, low energy levels may develop. If you notice changes in your loved one’s energy levels, make an appointment with his or her healthcare provider. The doctor can determine which medications are causing the side effects and may then reduce the dosage. If a dosage reduction fails to increase energy levels, the medication may be discontinued and replaced with a different one that is less likely to cause fatigue and diminished energy levels. It’s crucial for aging adults to meet their recommended daily allowances for vitamins and minerals. Failure to do so may result in sluggishness, low energy levels, fatigue, and suppressed immunity. Encourage your loved one to eat nutrient-dense foods such as fresh fruits and vegetables, lean meats and fish, and dairy products as tolerated. While consuming a healthy diet can lower the risk for nutritional deficiencies, severe deficiencies may require the addition of supplements. Some aging adults with health conditions or severe mobility issues require help with preparing meals or feeding themselves. For many seniors in Winnipeg, live-in care is an essential component of aging in place safely and comfortably. However, it’s important for them to have caregivers they can trust and rely on. At Home Care Assistance, we extensively screen all of our live-in and 24-hour caregivers and only hire those who have experience in the senior home care industry. Our strict requirements ensure seniors can remain in the comfort of home with a reduced risk of injury or serious illness. Carrying excess weight, especially in the abdominal area, can zap energy levels and even impair breathing. Being overweight may also make it difficult to exercise and navigate stairs. Conversely, aging adults who are underweight may lack energy because their nutritional intake isn’t optimal and vitamin and mineral deficiencies have developed, causing weakness, dizziness, fatigue, shortness of breath, and a higher risk for contracting infections. Elderly people sometimes experience anxiety, sadness, and depression. These symptoms are often the result of loneliness, social isolation, or the loss of a spouse. Depression could cause seniors to lose interest in things they may have once enjoyed, sleep too much, and neglect their nutrition. If your loved one exhibits signs of depression, make an appointment with his or her physician, who may refer your loved one to a mental health professional. Once depression or other emotional health issues have been treated, your loved one may feel more energized. While most people associate allergies with a runny nose, watery eyes, nasal congestion, and sneezing, allergic reactions can also cause profound fatigue. This symptom may be related to the expression of pro-inflammatory cytokines that are released in large amounts when the body is exposed to an allergen. Another reason allergies may cause low energy levels in aging adults is because allergic reactions can trigger a systemic inflammatory response. When this happens, your loved one may experience muscle pain, fatigue, joint swelling, and malaise. If your loved one develops allergy symptoms, see an allergist to determine the cause. Once allergies have been treated, your loved one may regain his or her energy. Although older adults may never fully replicate the energy levels of their youth, strategies such as the ones listed here can boost their vitality and overall wellbeing. Seniors who want to remain healthy as they age can benefit in a variety of ways when they receive professional at-home care. Winnipeg, MB, Home Care Assistance is here to help your loved one accomplish daily tasks, prevent illness, and focus on living a healthier and more fulfilling life. To learn about our high-quality in-home care services, give us a call at (204) 489 6000 today.